This is my take on the classic recipe for French steamed mussels — you know, the big bowl of mussels bathed in white wine, butter and garlic? It’s both easy and quick, but like all such recipes, the quality of the ingredients matters a lot. 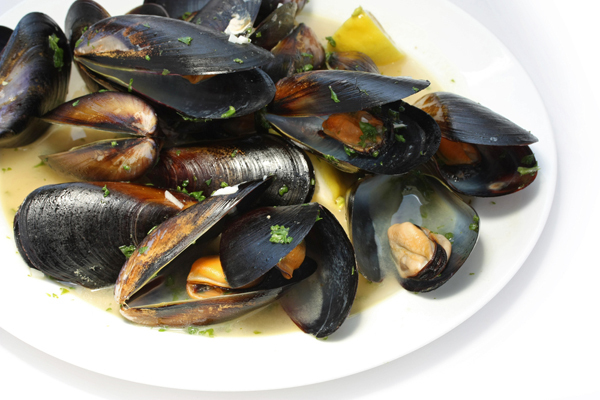 Collect or Buy the best mussels and good sweet butter and use a white wine you’d drink yourself. Figure on a pound of mussels per person for a main course; this recipe serves 2. Scrub and debeard the mussels. The “beard” is the fibrous hairy thing hanging from one side of the tasty bivalve. Pull it off with a side-to-side motion.In case you are wondering, a mussel is alive if it reacts. Its shell should be closed. If it is open, sit the mussel on the kitchen couter for a bit. It may close when you are not looking. Heat the butter over medium-high heat in a large, wide-bottomed pot with a lid; I use a Dutch oven. Saute the shallot or green onion until it is soft but not browned. Add the garlic cloves if using — if you are using green garlic, leave it out for now. Add the white wine (I’d suggest a chenin blanc or something crisp, but you can use any decent white), and bring it to a boil. Add the mussels in one layer if possible. Serve with crusty bread, more white wine — and an extra bowl for the shells. Please read our General Disclaimer.